Wilma LaRue Heyrend, 95, passed away peacefully, Friday, July 6, 2018 at Elegant Assisted Living. Wilma was born in Pocatello, Idaho on May 7th, 1923 to Leo and Orilla Farnsworth. 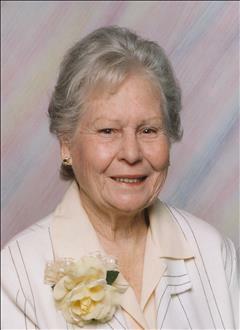 She was raised in Idaho Falls where she met and married Harvey Heyrend on October 9, 1939. Together they raised 10 children. They moved to Pocatello in 1959 and made this their home. She retired from Lambweston in 1978 and enjoyed retirement by going fly-fishing and taking various trips with her husband in their new travel trailer. Wilma is survived by her children: Keith (Jolene) Heyrend; Boyd Heyrend; Fred (Debbie) Heyrend; Lewis (Terrie) Heyrend; Jannie Daughtry; and Dan Macleod. She was also survived by: 17 grandchildren; 36 great-grandchildren; 3 great-great-grandchildren; and her sister, Margene (Archie) Stoddart. She was preceded in death by: her husband, Harvey; her sons, Dennis Heyrend; Jerry Heyrend; and Kenneth Heyrend; her daughter, Beverly Jacobs; her two grandsons, Jeremy Heyrend; and Danny Heyrend; her parents; five sisters; and her brother. A viewing will be held Wednesday, July 11, 2018 at 10am followed by the funeral service at 11am in the Cornelison Funeral Home, 431 N. 15th Ave., Pocatello. She will be laid to rest at the Pioneer Cemetery in Rigby, Idaho.